Pesto and fish seem like they were made for each other. Pesto is such simple sauce that can be made with just about any leafy green, nuts, a little cheese, some garlic and oil. This recipe + a bright glass of white wine + Alaska Cod = wicked delicious! Trim and cut kale from stem and center rib; place in blender. To toast the nuts, place in sauté pan over medium heat. Cook until nuts are brown and toasty, shaking the pan every so often. Place toasted nuts, garlic, cheese, salt, lemon zest and 1 tablespoon lemon juice in blender. Puree; slowly drizzle oil into mixture until it is as smooth as you like it. Season to taste. Simmer all ingredients on medium-low until it becomes jam-like, about 20 to 30 minutes. Puree, if desired; keep warm. Preheat oven to 450ºF. 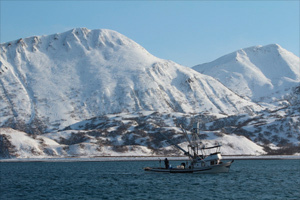 Rinse frozen Alaska Cod under cold water to remove any ice glaze; pat dry with paper towel. Rub 1 tablespoon of pesto onto each fillet, reserving about 2 tablespoons pesto. Place seafood on spray-coated pan or foil-lined baking sheet and roast for 12 to 15 minutes for frozen cod or 10 minutes for fresh/thawed fish. Cook just until fish is opaque throughout. 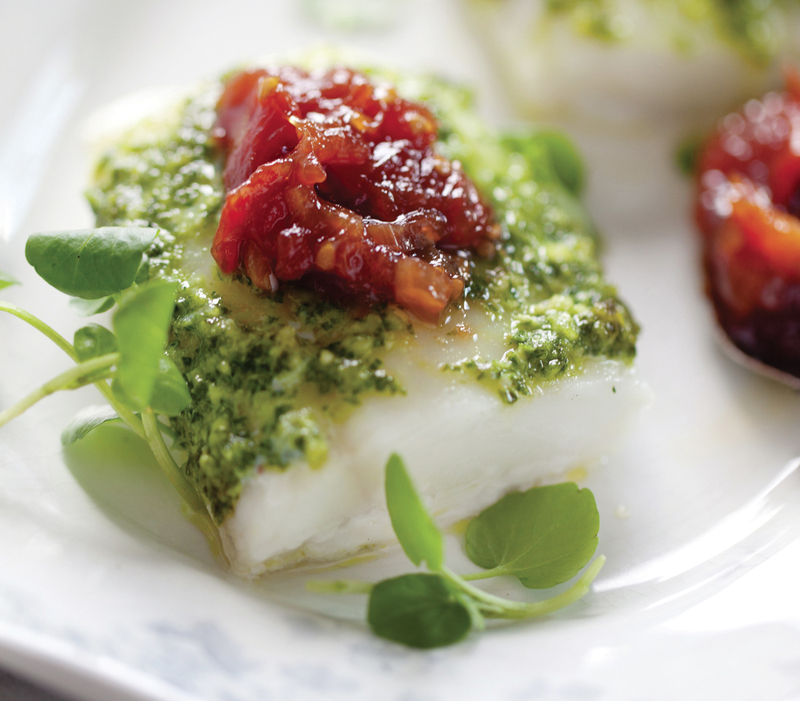 To serve, top with reserved pesto and a dollop of tomato jam. Nutrients per serving (without sides): 176 calories, 8g total fat, 1.5g saturated fat, 41% calories from fat, 66.5mg cholesterol, 25.5g protein, 1g carbohydrate, 0.5g fiber, 440mg sodium, 22mg calcium and 420mg omega-3 fatty acids.